Documentation of our off-line art projects. Click "read more »" to see detailed documentation. MTAA has released their digital image “AutoTrace #1 (Full Fathom Five)” under a Creative Commons license. Please read the license, Creative Commons Attribution 3.0 Unported License, before using the image. The Commons Art Diagram is a digital image that illustrates where the ‘art happens’ or the ‘art could happen’ within the alternate sharing economy. “10 Pre-Rejected, Pre-Approved Performances” was a list of performance-based artworks that had been rejected by curators at various venues worldwide. An on-line vote via the MTAA website determined which performance was created. Documentation of the performance and voting process was shown as the final piece. Another in our series (1, 2) of gallery reception desk mods/interventions, “3’ High & Rising, Newark” took Aljira’s reception desk and placed it 3 feet above the gallery floor. We’ve released a resolution independent vector art version of the Simple Net Art Diagram. 2000, large format inkjet print, computer, Yahoo! MTAA proposes to extend the exhibition space of star67 gallery, brooklyn, by the amount of 3 megabytes of disk space on the servers of yahoo.com. A framed photograph announcing the opportunity to win the artists’ friendship for one month. MTAA barricaded themselves into an area of the PS1 courtyard on a misty summer day. Pirated Movie was a screening of a pirated version of Disney’s Pirates of The Caribbean, The Curse of The Black Pearl. The pirated video was screened in black and white and silently while five of NYC’s most interesting artists, DJs, and musicians provided a completely new soundtrack live during the screening. MTAA created a single, digital image for a solo show at Rome Arts. Lo-Fi MB was a temporary site specific installation. This sculpture is documentation of MTAA’s famous Direct To Your Home Art Projects (DYHAP) which were conducted online and via the US mail from November 1997 through November 1998. Endnode is a networked sculpture that literally and figuratively represents the branching of the Internet. 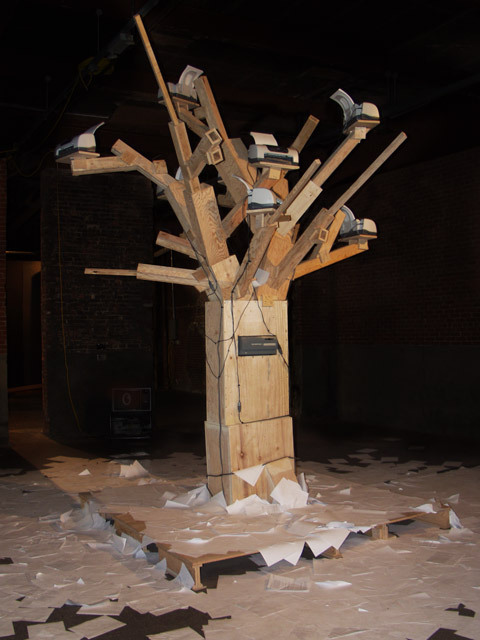 Printers nested within the plywood branches of a large “tree” produce hard copies of emails that fall to the ground like leaves or apples, becoming “endnodes” in the worldwide information flow. The general aesthetic of the piece is home-made “Franken-tree.” The emails come from a list created for the project that is centered on art, technology, and communication. Online avatars M. River and T. Whid guide the project. A treasure hunt through downtown Providence, RI. MTAA distributed brochures throughout the city in hopes of luring the citizens into a mass treasure hunt. A guerilla edit of the pro-Bush propaganda film DC 9/11 - A Time of Crisis. The video is a collaboration between new media art duo MTAA, video artist bodyatomic and musician/DJ tinydiva. Restless Crowd Control was an environment created for a performance night. Cage Match was a site specific installation at 31 Grand, a gallery in Brooklyn, NY. Bunker Flood was a site specific installation at White Columns in NYC. The Art Film Slide Advertisements are shown before screenings of art films, lectures, panel discussions, or performances. The “1 Year Performance Video (installation version)” recasts the set of 1 Year Performance Video as a sculptural tableau with the 1YPV vidoes projected on the rear wall. Custom-built software runs two video channels independent of one another. Once the software is started it’s programmed to run for one year. The number of days the software has been running is displayed above the video.